Hi there! Does the coconut milk leave a slight coconut taste. As much as I love coconut, my dairy allergic son is not a fan! Ah, good point about rice milk being too thin and the plain coconut milk. Thanks..we’ll give it a try! You’re welcome:) Let us know how it goes! Thank you so much for posting this! My son was diagnosed with multiple food allergies last spring and I have been looking for this exact recipe for several months. The hubs developed lactose intolerance a couple years ago. After that I realized how many of the casseroles I made all the time had dairy. Today I made him one of his old favorites – sour cream and chicken enchiladas. I used this soup recipe with tofu sour cream and veggie cheddar “cheese” and he was in heaven. We’ll be keeping this in the freezer all the time now. I used soy milk instead of coconut because we had it on hand. Thank you!!! That sounds great! I’d love to have that recipe Amy! This sounds great! I have one question, can I freeze it for later? Will it still work if I freeze it and thaw it then use it? Thanks! Yes! You can definitely freeze it. I do it all the time. Thank you! Thank you! I followed the recipe using Silk Coconut Milk Original. There was no taste of coconut at all. I added chopped onion, chopped celery,onion powder, the smallest pinch of cumin, and celery salt for a little depth of flavor. This recipe can easily be turned into dairy free cream of mushroom. A tip for no clumping. In a separate bowl, I added the flour by 1/4 cups into the cold coconut milk and stirring until it incorporated then added the mixture into the warm chicken broth, stirring until it thickens under medium to low heat. So happy to have this soup base. It will open up so many recipe options for my dairy allergic 5 year old! 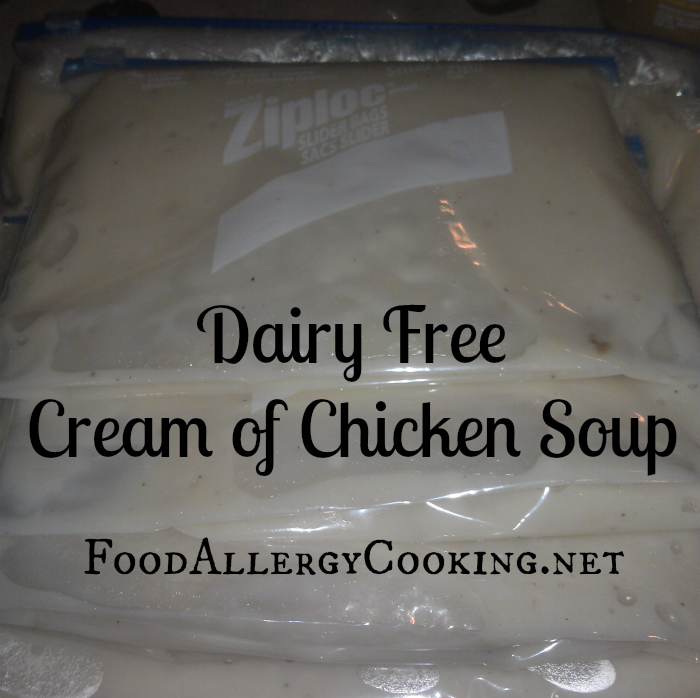 This is great, alot of my crockpot meals require cream soups. At the top it says to put in 2 cup servings. Is that the equivelent of 1 small can of cream soup? Thanks for reading! Yes, that’s the amount I use to substitute for 1 can. You might could go a little less (1 1/2 cups) maybe? 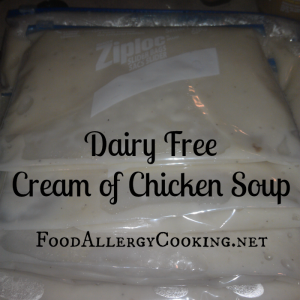 I have a question…my son is allergic to not only the dairy but wheat. So I can not use regular flour. Has anyone tried any other flour that worked in this recipe? I used gluten free flour but it required much less…something like 5 or 6 tablespoons. I didn’t measure the flour and just sprinkled it in slowly as I wished and stopped adding when the mixture thickened. I also added some onion powder, garlic powder, a bit of cumin and some celery salt. It tastes yummy! I plan to use it for chicken enchiladas. We’ll see if it works!